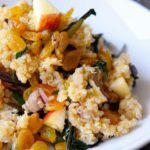 This clean eating red dandelion quinoa salad is a delicious blend of sweet and bitter flavors with a heartiness sure to fill you up. The most undervalued and underutilized flavor in cooking is the bitter flavor. Most people associate bitterness with something that tastes bad. But nothing could be further from the truth. If cooked properly, bitterness in food can be quite delicious. I promise! Red dandelion greens are actually not dandelion greens at all. They are related to chickory and are also known as Italian dandelion. They have lots of vitamins such as K, A, C, calcium and iron. Goes great with pastas and in soups. Pairs well with most main course meats. Makes a plant based meal all by itself. Has a nice balance of bitter and sweet. Packs and travels well for lunch the next day. Probably not too kid friendly unless your kid(s) grew up eating bitter greens and likes them. This clean eating red dandelion quinoa salad recipe is truly for those who love their greens and value the nutrition they provide. The bitterness is not overpowering and is nicely balanced with the raisins and apples. It could potentially be a bit of a “culinary adventure” for somebody who has never had bitter greens before, but it’s worth the effort. Yum! 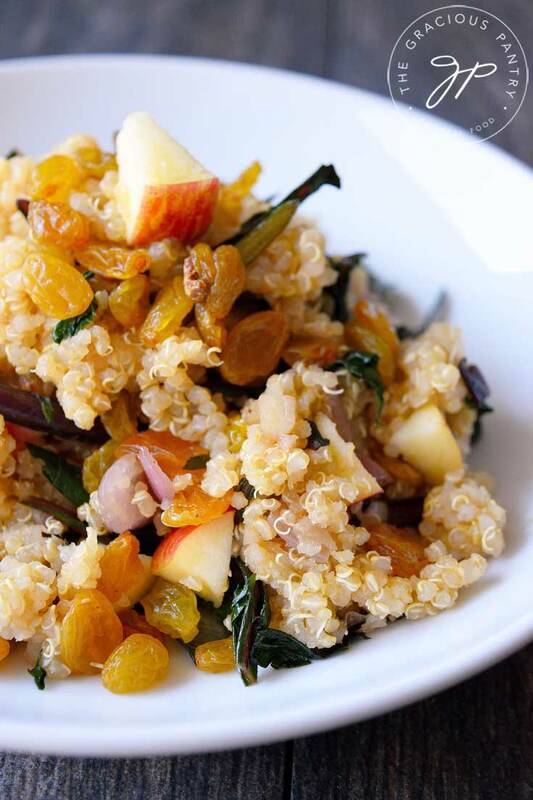 A deliciously different quinoa salad for adventurous tastebuds. Stir in the red dandelion and shallots and cook until the dandelion is wilted and the shallots are lightly browned. At the last minute, stir in the garlic and continue to sauté for approximately 1 minutes, or until the garlic just barely begins to turn brown. Remove from heat immediately. Stir all ingredients together in a large mixing bowl and serve.